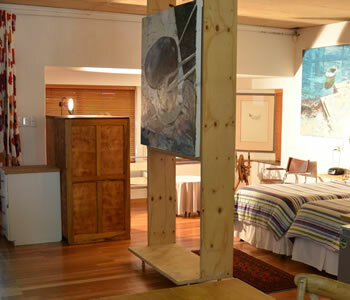 Accommodation at a 4 star upmarket guesthouse near the University of Pretoria and HPC. In the spirit of a boutique hotel with 4 self-catering apartments units and 5 double rooms we provide luxury but affordable overnight stay in an up market, architecturally designed lodge. We can provide group accommodation for up to 21 people. We are close to the Hatfield Gautrain station, which is two blocks away. We offer a free shuttle service for pick-ups and drop offs at the Gautrain Station. The High Performance Centre of UP is also two blocks away and Affies, Afrikaans Hoër Seunsskool and Afrikaans Hoër Meisiesskool as well as Pretoria Boys High School, PBHS, Pretoria Girls High and St Mary’s DSG are close by. LC de Villiers, Tuks sportgrounds and Hillcrest Swimming pool are literally just around the corner. Hillcrest Boulevard is close by with a convenient Woolworths Food. 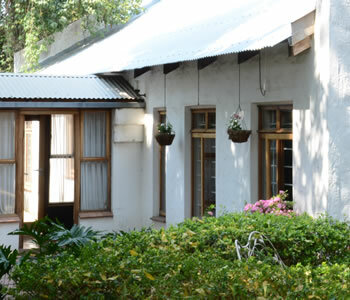 The relatively cheap accommodation is tucked away in the quiet residential area of Hatfield as well as on the edge of the CBD of Pretoria, Tshwane. Hatfield shopping precinct, Loftus and the Urology hospital are within walking distance. Other medical facilities that are close are the Pretoria Eye Institute, Optimed eye and laser clinic and The Ear Institute. Tukkies’ nearest campus entrance is 6 city blocks away. Access to the N1 and N4 freeway is literally around the corner and will take two minutes to access. The suburb of Hatfield has quite a lot of restaurants and take out eating places and at Hatfield Plaza opposite the old Hatfield Square, there is a Pick ‘n Pay and local Spar for your self-catering grocery shopping. The centre is a 10 minute walk from us. The property is safe and secure with free parking behind remote controlled electronic gates, for which you receive your own remote. An extensive alarm system is always activated and supported throughout the day and night. The accommodation is inexpensive if considered what we offer. All the luxury rooms have free Wi-Fi internet access and hotel bouquet DSTV, en-suite bathrooms and are fitted with either king or twin beds and only the finest linen. Some have air conditioning, others a fan. 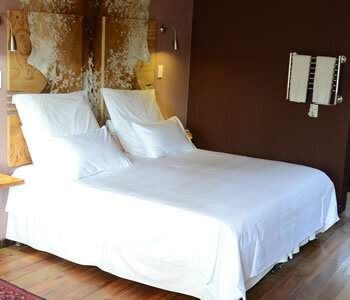 Our rooms are up market, spacious, comfortable and airy. All the rooms have showers and six have a bath as well. 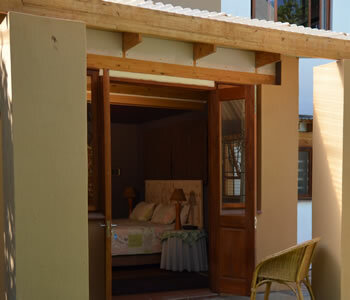 The rooms are stylishly decorated in an alternative African idiom and all the rooms have a private entrance, some going out onto a veranda for smoking and early morning sunning. There is a private garden for the guests, overlooking the swimming pool. All the rooms have a hair dryer, Nespresso coffee machines as well as instant coffee and tea facilities, mini fridge, mini hi-fi with DVD and clock radio. Electronic safes are in most of the rooms. Bed & Breakfast in Hatfield is the perfect accommodation for both business man and the recreational visitor who wants to be near the city centre as well as the highways as the N1 and N4 is around the corner.. Laundry service is on request, or can be done by the guests if they are staying long term.